Hop in the wayback machine – what did it cost to buy a home in 1916? 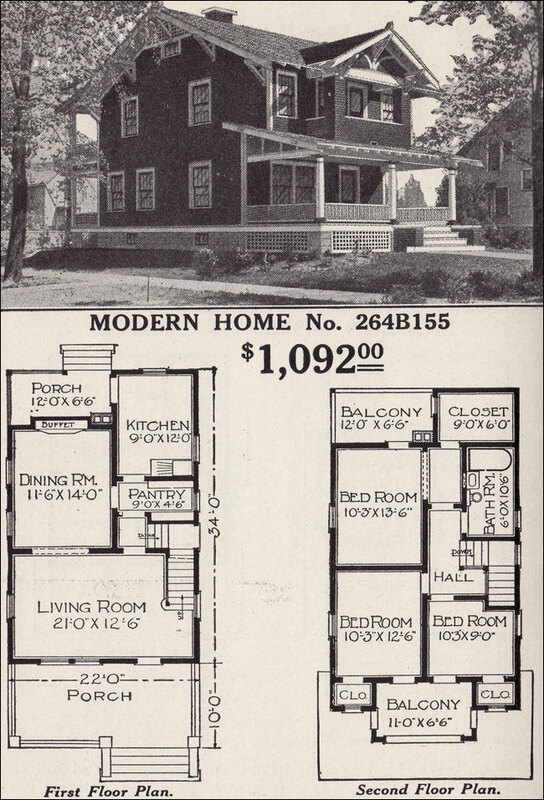 Here’s a fun one I saw recently – an ad from a 1916 Sears & Roebuck catalog for plans and materials to what is considered a two-story craftsman home. Well, there’s a few different ways to come at this. Along with what is known about Sear’s Roebuck homes from this time, plus generally held city requirements, as well as historical cost figures, we can compare and project forward 100 years to see how homes stack up. First though, I’m not a contractor, nor an expert on city building codes from 100 years ago, so welcome feedback and critique of any estimates in here. It didn’t include EVERYTHING though, a “heating plant” (furnace/boiler) was going to set you back $150 to $200. What’s more, it obviously doesn’t take into account masonry materials for a foundation, plaster for the walls, and labor to build this thing. Generally speaking, Sears seems to have estimated this at around 100-120% of the materials cost, so in the above case of our beloved 264B155 you’re looking at around $2,200 for the cheapest build possibility, and you still haven’t put in furnishings OR bought the land! OK, that still looks super cheap but let’s zero in on the cost a bit more. In Minnesota, basements are common, though from this age of construction, you can see a range of basement options from something as small as a cistern that holds only mechanicals such as the furnace and water heater to to a full block or stone foundation basement. The utility in 2018 would depend heavily on how it was constructed. A survey of home sales in Minneapolis built between 1915 and 1916 shows most to have full, unfinished basements from this period. While it may be added later in some case, let’s take it to our example and say 150% for masonry, labor and other costs will put us at a sound number. That puts us at $2880 and includes the heating mentioned earlier. I haven’t located a firm source to cite here, but in talking to family, my grandfather built his home in Minneapolis in 1942 and purchased a city lot of roughly 46 feet wide and 124 feet deep for $200 dollars. Adjusted for 1916 dollars, that’s $132 and change. Today that same lot would cost as little as $16,000 and as much as $115,000 depending on where you situated your little home. When the construction dust settles and it’s move in day, it’s the summer of 1916 and you’re moving into a home at cost just south of $3000 to situate and build. Your lovely little house measures just south of 1200 finished square feet and has three bedrooms, one bathroom, and natural woodwork throughout. By today’s standards, a lot of it would be very desirable. You could push the square footage to 1600 square feet by finishing the basement, but that’s not typical for the time, and at this time basement standards meant this was usually somewhat damp. On paper a $3000 house looks great, and we’ve all seen examples of costs from 100 years ago to now and know there’s more to the story. Based on numbers from 2015 found in this article at US NEWS we see the estimate falls in line with the average home price of $3200. Its notable that the average wage was $687 annually, and typically there was one income in the house vs today’s two. If we adjust the numbers based only on inflation, this home would cost $72,000 to build today, but you’d be making only $16,000 per year. Today the median home price for the Twin Cities Metro sits at $250,000, and in real terms, we’ve seen plenty of 1200 square foot 1.5 story bungalows go in this price, so that bears out (Data from NorthstarMLS, March 2018). The most recent data for the average wage in Minnesota sits at $52,000 annually across all professions (Bureau of Labor Statistics). In both cases, the average home costs about 5 times more than the average wage. While it’s by no means a complete financial picture of homes and buyers, it is an interesting comparison. In some ways, we could say not much has changed, but in a lot of ways that count, things are better. In 1916, there was not such a thing as homeowners insurance, and that meant buying a home was a major risk in the face of damage or loss. There were few, if any zoning restrictions at that time, so where you lived may not be an unspoiled piece of heaven long after building. In 1920, according to this paper, only 1% of US homes had electricity and indoor plumbing, and heating was primarily coal-fired. This was a messy affair, and nowhere near the standards expected by people today. Thanks for the little trip through history! 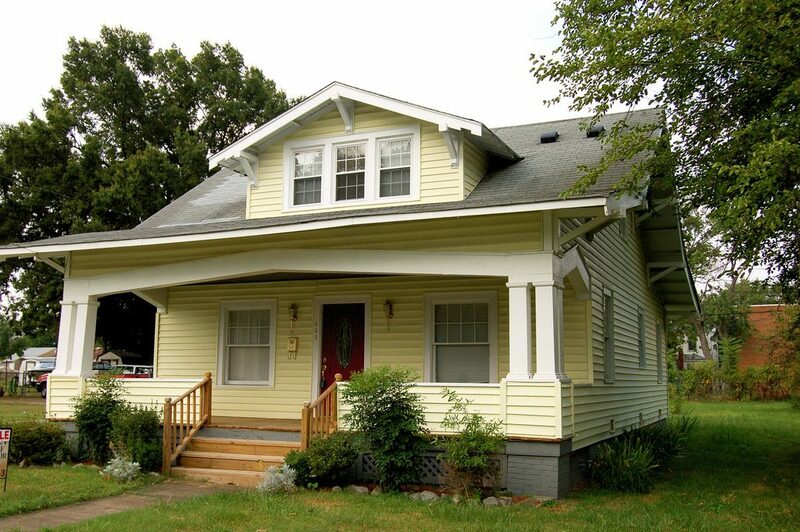 If you wish to start building your own history of home ownership, you know where to find us.